Before getting started we conduct an Online Assessment to get an understanding of where your sales team is. This evaluation is repeated five months later, to evaluate how effective the sales training was. We combine the results of the initial assessment with the desired improved performance, as put forward by the sales leadership team. Using this info, we design an effective Sales Training Solution, to equip your sales team with the speciifc sales skills they need to achieve their desired outcome. Your sales team attends three Face-to-Face workshops, conducted between 30 – 45 days apart. During each session they will be guided to adopt a few new crucial sales skills, or new sales behaviours, to enable them to optimise their ability to engage with their customers and prospects, positively influence them, build long term mutually beneficial sales relationships, prospect effectively, handle objections, ask meaningful, engaging questions, network more effectively, get referrals and ultimately close more sales. The workshops are designed to support, uplift and introduce the sales team to the sales tools and principles, we want them to learn. The application of the material, however, starts after the workshop is over, when they listen to the CD’s in their mobile university, use the online sales training system and engage in accountability partnerships. Your sales team will be given audio books containing all the specific sales skills they need to learn and turn into new sales behaviours. As they listen to these audio books, during their commute, they will reinforce and organise the requisite knowledge. To further support the learning process and to help your sales team to effectively apply the new knowledge in their own unique work environment. 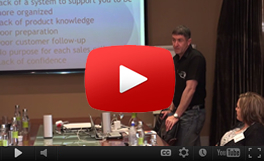 They are required to engage with our Online Sales Training Solution for 30 Minutes every day. This means that they learn and answer application questions daily, which they get to test in their wok environment daily. This initial sales training process is conducted over 12 weeks. The sales team will attend 3 engaging and interactive, full day workshops, conducted once a month. During each session they will be guided to adopt a few new crucial sales skills, or new sales behaviours, to enable them to optimise their ability to engage with their customers and prospects, positively influence them, build long term mutually beneficial sales relationships, prospect effectively, handle objections, ask meaningful, engaging questions, network more effectively, get referrals and ultimately close more sales. The sales team is supported with, audio books, which they listen to in their mobile university (cars), this supports them to learn and internalise all the sales skills, tools and techniques they need to learn. We ask for an investment of 30 minutes a day from each sales team member, to use the Online Sales Training Solution. This Online Sales Training tool, supports them, to further enhance their knowledge and understanding around the sales tools and concepts we want them to learn, but most importantly it supports them to actually apply the new sales skills, tools and techniques in their workplace. The Online Sales Training Solution also offers, feedback to the leadership team as to the level of participation and commitment of each individual sales professional. This feedback serves to keep the leadership abreast of progress, so that they can offer the team encouragement and support. Your sales team is also supported with emails, which serve to remind them to take specific action and guides them as to how they should apply the specific tools, which they have learned during each workshop. Tailor made SMS messages, will also support them to remember to perform their new daily routines, until they become entrenched sales success habits. .
We offer a pre and post workshop Sales Competence Questionnaire, which assess the eight crucial competencies necessary to be effective as a sales professional. Ability to perform the right daily sales activities. Accountability partnerships are formed to assist all sales professionals to remain on track. A daily inspirational message is sent to each member of your sales team. This is an opt-in system that delivers an inspirational message right into the email of everyone that signs up on our website. The inspiration or motivation may fade after attending our sales and relationship building workshops. This daily inspirational message is designed to help maintain the momentum created by the workshop. Positive Affirmation CD This CD is an audio recording containing positive affirmations. This resource is used daily to create a positive start to every day and helps to remove those nagging negative thoughts that flow so freely through our minds every day. When used consistently this CD will give you a positive start to every day and set the tone for an amazing day.